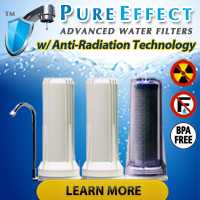 We have posted a number of articles about nitrates in drinking water and given a number of links to products that can remove nitrates from drinking water… and today we found out that FilterWater.Com has started carrying a highly effective nitrate removal system made by Crystal Quest that costs less than $150, features a dual filter system containing a total of 7 filtration stages, and qualifies for free shipping. Do I have nitrates in my drinking water? Nitrates occur naturally in the environment and may come from any number of sources in nature including, but not limited to, animal waste that filters down into the aquifer. Wells tapping into that aquifer as a source of drinking water then pull the water to the surface where it gets used by the well owner for cooking, drinking, bathing, etc. 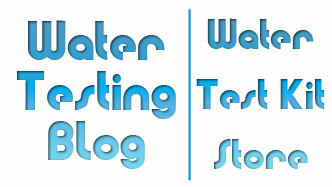 Springtime Testing of Well Water in Farming Community? What harm can nitrates in drinking water do? How can I get rid of nitrates in my water? We started this posting by saying that Filter Water now carries a dual filter counter top nitrate removal system… so now we figure we ought to tell you a little more about it. Stage 1 — This product uses as dedicated nitrate removal filter. Water first flows through a nitrate-selective resin cartridge designed to reduce nitrate levels in water by 90 to 95 percent. The cartridge has an expected nitrate capacity of approximately 5500 ppm and owners can regenerate (aka: recharge, flush out, clean) the cartridge using a sodium chloride brine solution when it gets full. Stages 2 & 7 — Pre and post one-micron filter pads remove suspended particles such as silt, sediment, cyst (Giardia, Cryptosporidium), sand, rust, dirt, and other undissolved matter in the water. Stages 3 & 4 — Specially formulated beds of copper and zinc (KDF-55D, and KDF-85D) use a process known as oxidation-reduction to exhaust any chlorine in the water and convert iron and hydrogen sulfide into insoluble matter which attaches to the surface of the media. Heavy metals such as lead, mercury, copper, nickel, chromium, cadmium, aluminum, etc. also get removed during stages 3 & 4. Stage 5 — Ion exchange resins reduce heavy metals such as lead, copper and aluminum further and also reduce water hardness by filtering out magnesium and calcium. Stage 6 — Granulated Activated Carbon (GAC), a universally recognized and widely used adsorbent for a wide variety of unwanted drinking water contaminants such as chlorine (99.9%), chemicals linked to cancer (i.e. THM’s, benzene) pesticides & herbicides such as atrazine and simazine, insecticides, volatile organic compounds (VOC’s), PCB’s, MTBE’s and hundreds of other chemical contaminants which could possibly exist in your water supply. 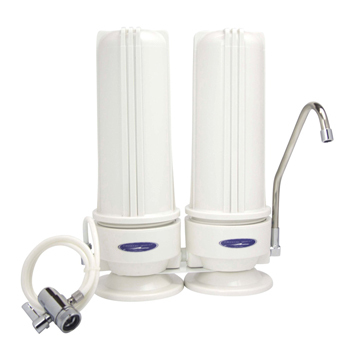 Other features of the Dual Filter Nitrate Removal System? Many people simply do not want to mess around with plumbing under their sink so a unit like the Crystal Quest Dual Filter Nitrate Filter System which requires no plumbing will work out beautifully. The unit sits quietly next to the sink on the counter top and connects easily to pretty much any standard kitchen faucet. It also comes with a diverter valve which allows people to switch between filtered and unfiltered water with the flip of a switch. Not digging the stark white appearance of the filter? Don’t worry! You have the option of ordering the unit with a chrome finish if that better suits the decor of your kitchen. How long will the filters last and what do replacements cost? The manufacturer estimates that the filters ought to last between 1 and 3 years depending upon the initial quality of source water. Keep in mind, though, that a soaking of the nitrate-specific cartridge in sodium or potassium chloride solution at room temperature will recharge the cartridge for additional use. When it comes time to replace the nitrate-specific filter cartridge it will cost around $50 and the 6-stage filter cartridge will cost about the same.